The 3rd Annual World Lemur Festival will be celebrated in Madagascar and around the world from October 28-29, 2016. With over 90% of lemur species facing extinction, the time to act is now. Let’s stand together as one voice this October for the World Lemur Festival, and tell the world how important and amazing lemurs and Madagascar are. The World Lemur Festival is for everyone—lemur fans and conservation leaders, scientists and artists, teachers and students, kids and parents, and YOU! We encourage lemur fans around the world to celebrate and spread the word. 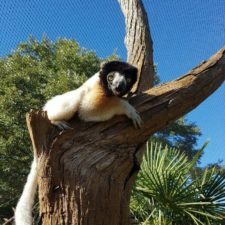 Many LCN members will be holding events throughout Madagascar with local communities; and zoos, universities, and other organizations around the world will be incorporating special lemur events into their programming. If there isn’t an event near you, plan one! Last year, lemur fans held Madagascar-themed parties and happy hours, raised funds for their favorite organization, spread the world on social media, and organized events at their local schools and zoos during the weeks leading up to and after the World Lemur Festival. 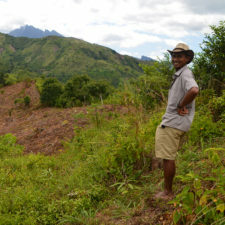 These events are a great way to connect with fellow fans of lemurs and conservation, geek out about lemurs and Madagascar, and share your Madagascar travel stories and dreams. The 2016 World Lemur Festival and World Lemur Day graphics were designed by Lauren Petronaci, who works at the San Diego Zoo Safari Park and volunteers for Lemur Love. Thank you, Lauren! You are welcome to use this graphic on your promotional materials for your World Lemur Festival events, and to share it on social media. If you prefer to design your own graphic or logo for your event, go for it! 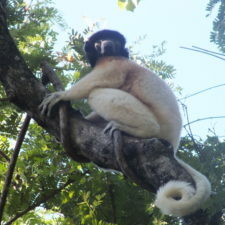 * Web graphics (PNG files) are available with both World Lemur Festival and World Lemur Day text. In the Dropbox, there is also a layered Photoshop file (PSD) with editable text so you can add your own event date and location information. 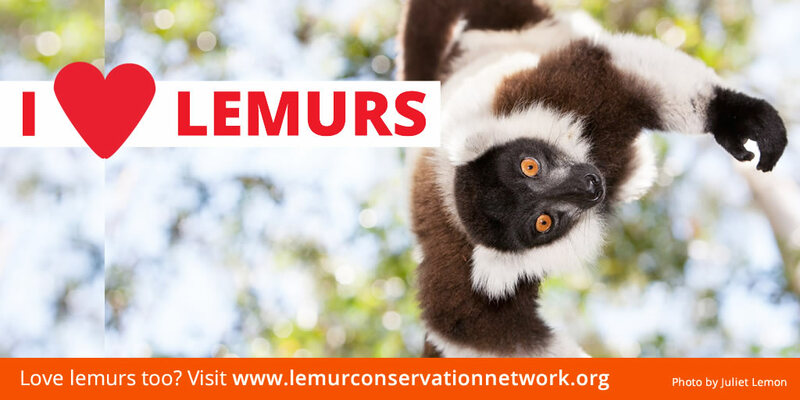 * This folder also contains a PDF of a Lemur Conservation Network flyer and other various LCN graphics you are welcome to use. 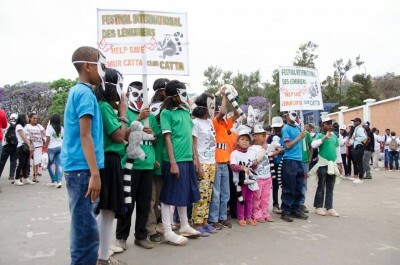 Carnival at the 2015 World Lemur Festival in Antananarivo. Photo courtesy of Mikajy Natiora. If you plan to hold an event or know of an event that’s not listed, let us know! We will add your event to our map and event blog post. After your event, send us your photos and stories, so we can share them in our World Lemur Festival Wrap-Up blog post and on social media. Email your event details to LCN Director Corey Romberg at cbromber@asu.edu or submit via our contact form. 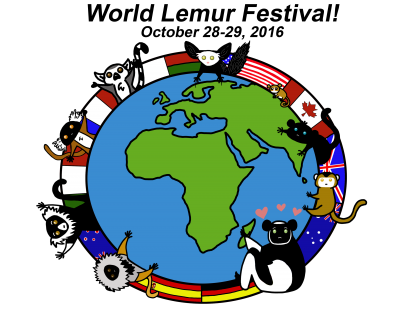 All proceeds from t-shirt sales support the World Lemur Festival in Antananarivo, Madagascar, hosted by GERP. 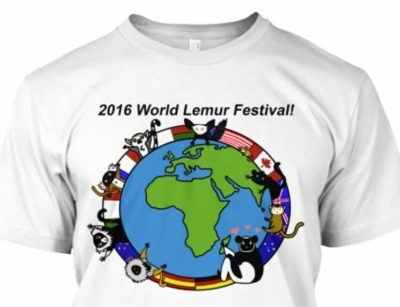 Shirts are available with both World Lemur Festival and World Lemur Day text. Buy a shirt before October 7 to get it before World Lemur Day! You will still be able to get a shirt in our second round of sales after October 7 if you miss this deadline, but ordering now ensures faster delivery. World Lemur Day = Social Media Blitz! 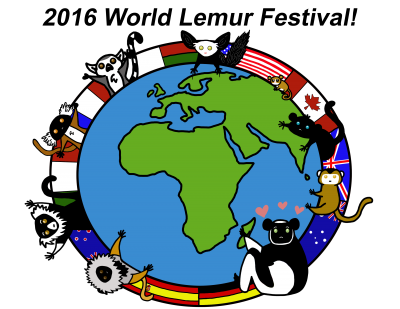 2016 World Lemur Day will be held on Friday, October 28, 2016. While the World Lemur Festival involves physical events, World Lemur Day is one day of the year for us to let the world know about lemurs and encourage their protection. So, get your typing fingers, emoticons, and best lemur photos ready because we want all lemur fans to do a social media blitz on Friday, October 28! * Remember when sharing social media posts that we strongly discourage sharing photos or videos that show lemurs interacting with humans, because while they may be cute, these images and videos promote keeping lemurs as pets. Learn more about this threat. Post a picture of yourself wearing a lemur costume or lemur attire using hashtags #WorldLemurDay and #LetsSaveLemurs — we’ll share your photos in a World Lemur Day recap on LCN’s Facebook page! 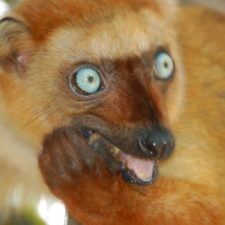 Change your profile picture to the World Lemur Day logo or your favorite lemur photo. Change your Facebook banner image to the I love lemurs graphic. Share lemur photos, links to your favorite conservation organizations, your favorite lemur memes, cute lemur videos, and photos of your travels to Madagascar with your friends on social media. Encourage friends to donate to support lemur conservation. Use the hashtag #WorldLemurDay or #LetsSaveLemurs in your social media posts all week!